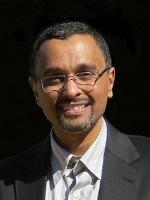 Parthasarathy Srinivasan, an associate professor in the Department of Mathematics, has received funding from the National Institute of Food and Agriculture (NIFA), a federal agency in the US Department of Agriculture (USDA), to reduce outbreaks of foodborne illness resulting from contamination of fresh produce by pathogens such as Salmonella, Listeria, and E. coli. The project, titled "Modeling Pathogen Cross Contamination & Chlorine Dynamics in Fresh Produce Cycles," has been funded for $258,248 for three years. Drs. Daniel Munther, an assistant professor in the Department of Mathematics, and Chandra Kothapalli, an associate professor in the Department of Chemical and Biomedical Engineering, are co-PIs. The CDC estimates that 1 in 6 Americans falls ill as the result of consuming contaminated foods or beverages. For fresh fruits and vegetables, contamination often results from washing or irrigation with contaminated water. 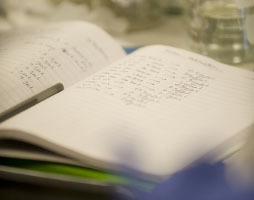 The CSU team will develop pathogen/produce specific quantitative models, informed by key experiments, to understand the dynamics of pathogen cross-contamination and quantify the factors that influence sanitizer efficacy in the washing process. These models have the potential to transform and positively impact produce safety by improving contamination control and reduce the burden caused by foodborne illness. Dr. Shawn Ryan joined CSU in fall 2016 as an assistant professor in the Department of Mathematics. 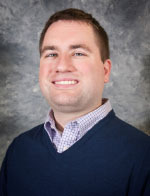 Previously, Dr. Ryan spent two years as a postdoc at Kent State University in the Department of Mathematical Sciences and the Liquid Crystal Institute where he developed models that could predict novel phase transitions in materials. He received his Ph.D. in mathematics in August 2014 from Pennsylvania State University, where he analyzed innovative mathematical models for self-organization in swimming bacteria. Before this Dr. Ryan completed the BS/MS Program in Applied Mathematics at the University of Akron. Dr. Ryan’s research focuses on solving problems at the intersection of mathematics, physics, and biology. He takes advantage of the tools and data in each field to build better models that are amenable to mathematical analysis. The unifying theme among his research topics is interactions (interparticle, molecular, fluid-mediated, etc.) leading to the emergence of natural phenomena. His ongoing work centers on developing math models for biosystems and materials that predict collective behavior that result in dramatic changes in the system's effective properties. Dr. Ryan is also interested developing computational algorithms and models for analyzing bacterial cross-contamination in the food industry. 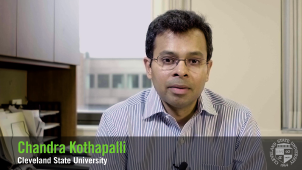 Research by Chandra Kothapalli, an associate professor in the Department of Chemical and Biomedical Engineering, is the focus of the latest installment of the Featured Researcher Video series. Dr. Kothapalli’s research targets the interface of engineering and medicine, particularly clinical applications in regenerating diseased or injured tissues and organs. Click here to watch. The Undergraduate Research Award (URA) program allows undergraduate students to obtain up to $1,000 for research in a CSU course during the academic year. Applicants must be CSU students with at least junior standing, and all forms of research, scholarship and creative activity are encouraged. There are two application deadlines each year: one for the fall semester and one for the spring semester. The deadline for fall 2017 funding is April 25. Click here for more information. Dr. Andrew Rindfleisch is a professor of music composition in the Department of Music, where he serves as the coordinator of the music composition degree program, the director of the Cleveland Contemporary Players Artist in Residency Series, and the manager of the Music Composition Resource Center he founded in 2006. He is the recipient of the Rome Prize, the John Simon Guggenheim Foundation Fellowship, the Aaron Copland Award, and the Koussevitzky Foundation Commission from the Library of Congress. More than 40 other awards have recognized his music, including the Cleveland Arts Prize, two individual artist awards from the Ohio Arts Council, and the 2004 CSU Distinguished Faculty Award in Research. Dr. Rindfleisch’s music is regularly performed throughout the United States and abroad, including recent concerts at Carnegie Hall. His music can be heard on eleven commercially released compact disc recordings, with four more currently in production. He has been invited to lecture about his music at over twenty other colleges and universities throughout the country. His career in music has also included professional activity as a conductor, pianist, vocalist, improviser, record producer, radio show host, educator, and concert organizer. As a conductor and producer, Dr. Rindfleisch’s commitment to contemporary music culture has brought over 500 works into performance and recording over the past twenty years. He holds degrees from Harvard University (PhD), the New England Conservatory of Music (Master of Music), and the University of Wisconsin-Madison (Bachelor of Music). The works of George Mauersberger, a professor of drawing in the Art Department, are the subject of two recent exhibitions. A watercolor exhibit was hosted at the Bonfoey Gallery in Cleveland in March and a retrospective of his pastel works is currently on display at the Butler Institute for American Art. His pastel retrospective, George Mauersberger - Pastel Drawings - 1991-2016, runs through May 14 at the Butler Institute for American Art in Youngstown, Ohio. Cleveland State received a Technology Validation Start-up Fund (TVSF) award from the Ohio Third Frontier Commission, part of the Ohio Development Services Agency, to accelerate technology transfer and commercialization of faculty innovations. CSU is partnering with Kent State University (KSU) to manage the TeCK Fund, which will provide faculty and startup companies from each university access to an $800,000 pool of funding that will assist with commercialization activities including creating prototypes and performing market research. The TeCK Fund fills a gap in support and funding for these activities, which are required to successfully spin off technologies. Faculty teams that complete the I-Corps@Ohio training program will be prioritized for TVSF funding. For more information on the TeCK fund and commercialization resources available to CSU faculty, contact Jack Kraszewski. Chip-based, Miniaturized 3D Bioprinting for Chemical Toxicity Assessment, led by Dr. Moo-Yeal Lee, an assistant professor in the Department of Chemical and Biomedical Engineering. A Privacy-Aware Compliance Tracking System with Real-time Feedback, led by Dr. Wenbing Zhao, a professor in the Department of Electrical Engineering and Computer Science. Campressor, based on technology developed by Kevin Calmer, BS candidate in Mechanical Engineering, led by Dr. Majid Rashidi, a professor in the Department of Mechanical Engineering. A U.S. provisional patent application was filed March 15, 2017 for Dr. Michael Kalafatis’ invention titled Death Receptors Predict rhTRAIL-Sensitivity. 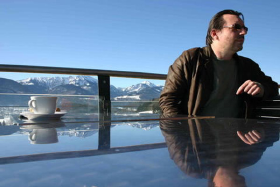 Dr. Kalafatis is member of GRHD and a professor in the Department of Chemistry. As an anti-cancer therapeutic, rhTRAIL holds great promise due to its selectivity for cancer cells. The invention is used to determine a patient’s susceptibility to rhTRAIL-based treatments, allowing a patient to be more appropriately placed in rhTRAIL clinical trials and improve rhTRAIL as an anti-cancer therapeutic. As a result, patients can receive potent anti-cancer therapy with reduced side effects. A U.S. provisional patent application was filed on April 3, 2017 for Dr. Ye Zhu, an associate professor in the Department of Electrical Engineering and Computer Science (EECS). The invention is titled Shoulder-Surfing Resistant Authentication Method, and the patent application is directed to protect a mobile phone user's login information from theft by a shoulder-surfing attacker. The Office of Research is pleased to announce an exciting portfolio of internal research projects that are being funded across the University. Undergraduate Summer Research Award (USRA): Forty-one proposals were funded across four colleges for a total of $288,000. These projects will support 70 undergraduate students. Dissertation Research Award (DRA): Sixteen proposals were funded across four colleges for a total of $75,559. Faculty Scholarship Initiative (FSI): Fifteen proposals were funded across four colleges for a total of $93,695; the FSI awards demonstrate the variety of scholarship at CSU, with projects being funded in music, news media, immigration policy, finance, literature, race relations, criminal justice, film, and addiction. CSU will host a symposium on May 5, from 8:00 am to 3:00 pm, at the Wolstein Center focused on a new Internet of Things (IoT) Collaborative initiated by CSU and Case Western Reserve University (CWRU). 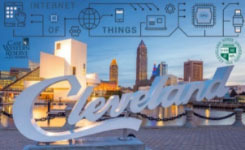 Speakers will discuss short- and long-term views of the future of R&D in the IoT, and will include key leaders from the City of Cleveland and the Cleveland Foundation, as well as from national organizations such as the MetroLab Network, the National Science Foundation (NSF), and Fortune 100 companies. Faculty with interests in connected technologies are encouranged to participate. There is no cost to attend, but space is limited and pre-registration is required. Please contact Ben Ward (b.j.ward@csuohio.edu) for details. The Center for Cybersecurity and Privacy Protection, part of the Cleveland-Marshall College of Law, will host the second annual Cybersecurity and Privacy Protection Conference on April 27 and 28. The conference focuses on innovative strategies that integrate legal, managerial, and technical approaches to managing cyber and privacy risks. 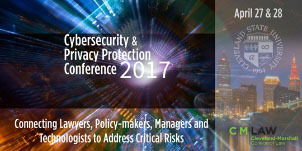 The conference brings together government officials, in-house counsel, business executives, cyber insurance leaders, litigators, information security officers and privacy managers to discuss current developments and best practices in cybersecurity and privacy protection. Click here to register. 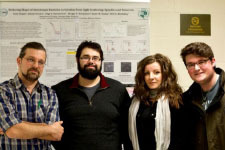 Ilona Tsuper, Dan Terrano, and Tony Dobrila, undergraduate physics students and Society of Physics Students (SPS) officers, won a $1990 SPS Chapter Research award for their proposal "Deducing Size and Shape of Gold Nanorods in Solution from Depolarized Dynamic Light Scattering Data." This student proposal was based on research supported by 2016 Undergraduate Summer Research Awards (USRA) and two semester-long Undergraduate Research Awards (URA). The CSU chapter of SPS is advised by Dr. Kiril Streletzky, an associate professor in the Department of Physics.